We often overthink entertaining. We get focused on preparing fancy food and long grocery lists. 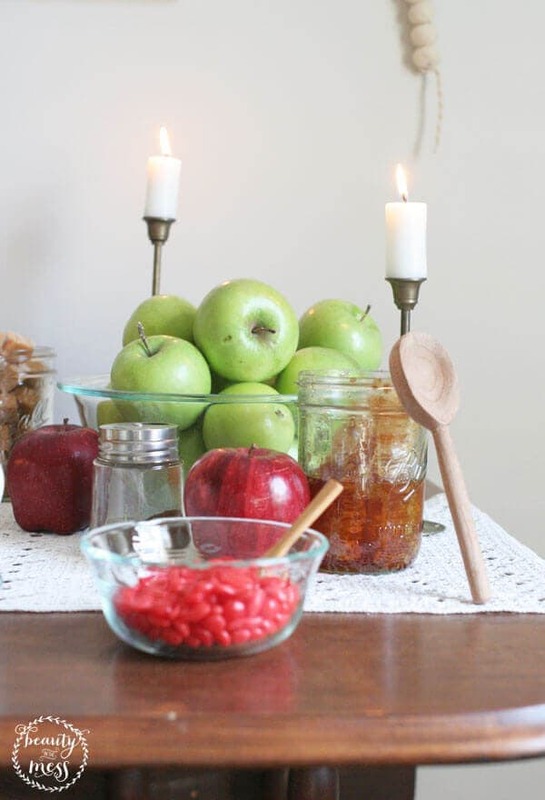 Today, I want to make your fall entertaining a bit simpler. 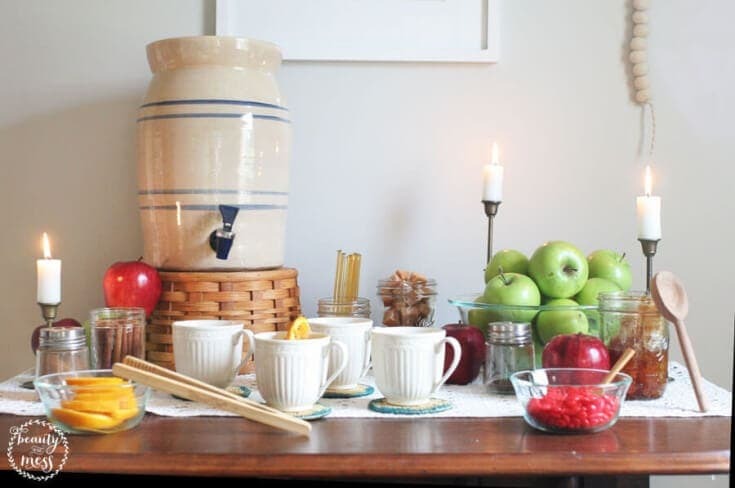 Make your next get-together memorable with an Apple Cider Bar. It’s not complicated or expensive, and yet it perfectly celebrates the fall season. 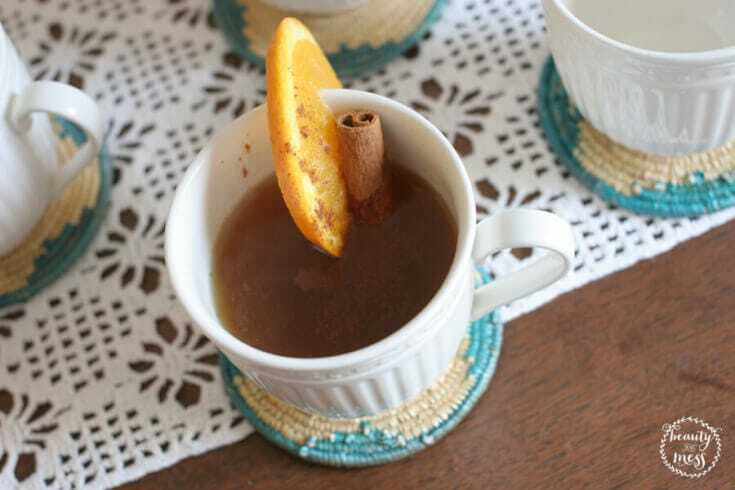 Apple cider is just the perfect fall drink. I know Pumpkin Spice Lattes have hit it big over the last few years, but cider is a classic. It’s warm, crisp, and full of flavor. 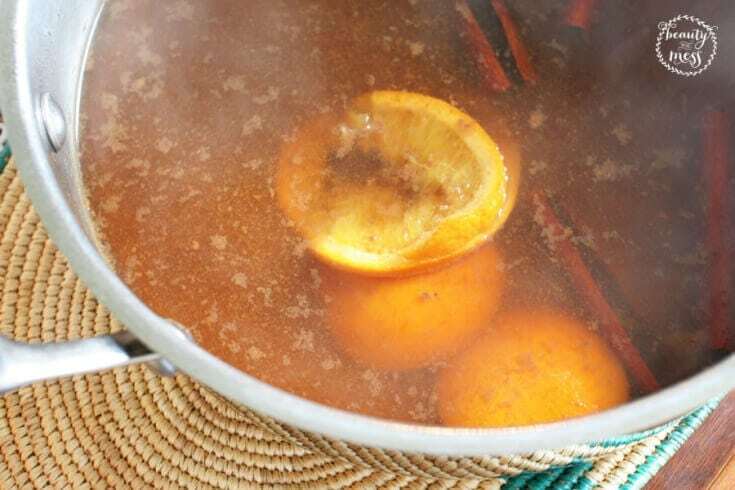 I like to cook cider on the stove top with cinnamon sticks, ground clove, and orange slices. 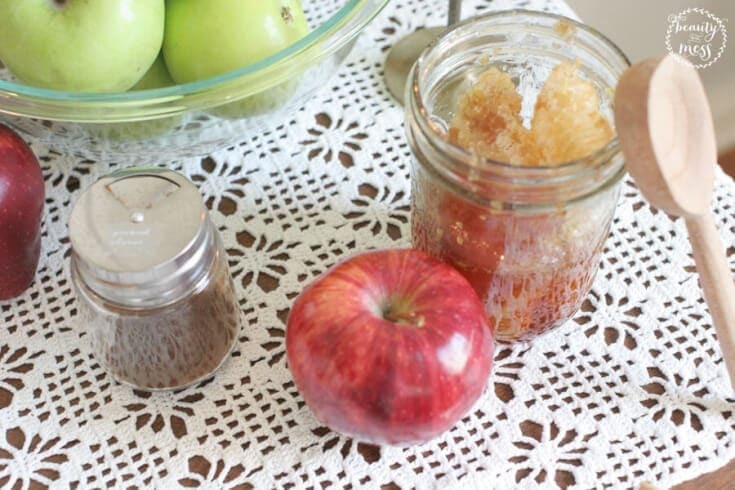 This combination gives the cider extra spice and sweetness. 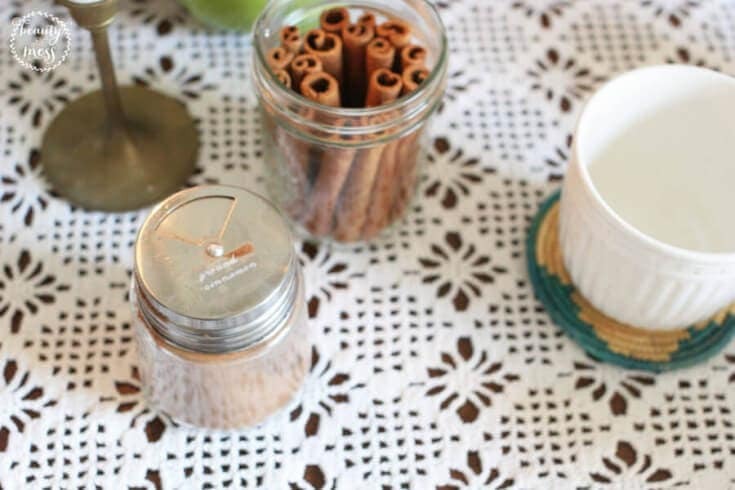 Plus, your house will smell AH-mazing. We have a drop-leaf table in our Breakfast Nook that I slid up against the wall with one side folded down. 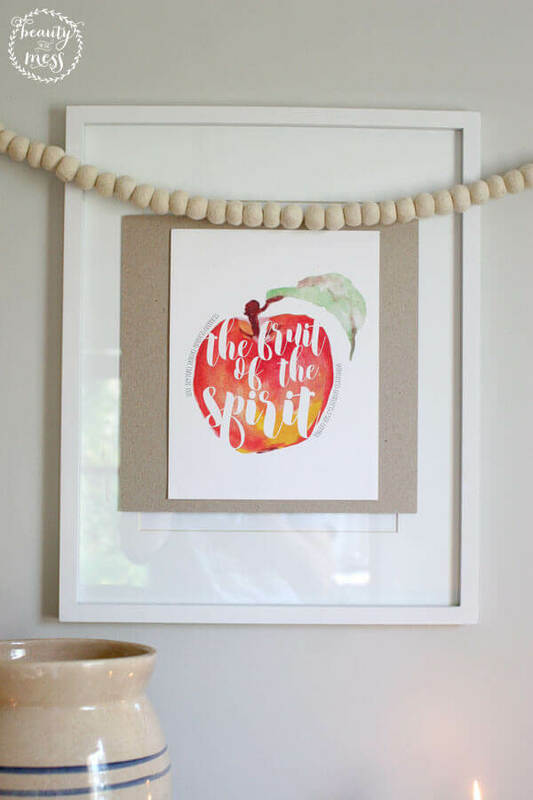 I used a piece of chipboard, layered with a Fruit Of The Spirit Print, to cover the artwork that normally hangs in that space. 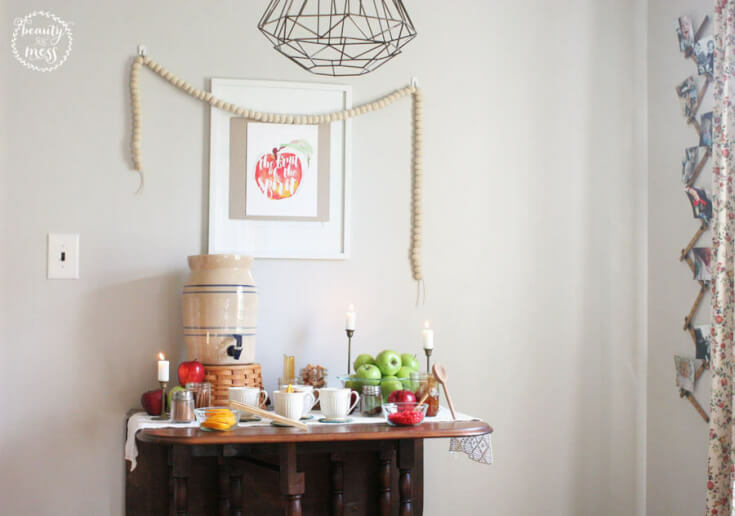 A felt ball banner hangs from two command clips in order to finish out the wall decor for this simple Apple Cider Bar. A lace runner is laid across the center of the table, topped with brass candlesticks and colorful apples. 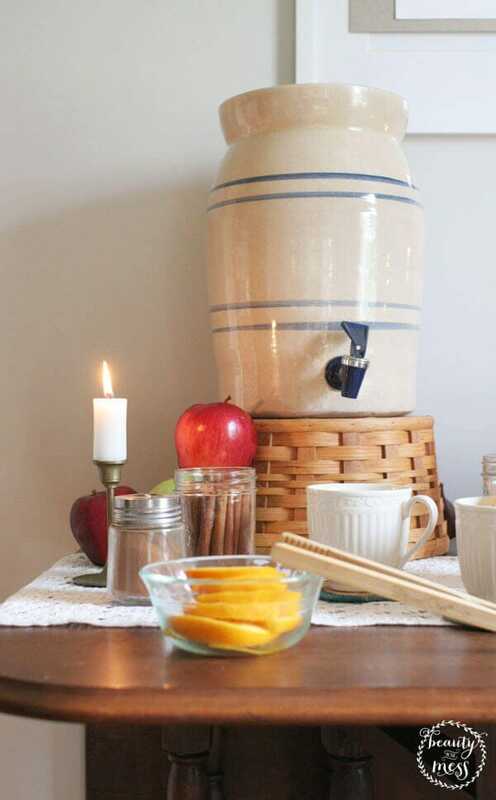 To add some height, the cider jug is set atop an upside down basket which ties in with the fall texture and color palette. I chose clear mason jar and bowls to hold the cider mix-ins so that all the tasty options are easy to see. For my drink, I chose an orange slice and cinnamon stick. Then, I sprinkled it with ground cinnamon. If you are a caramel lover, drop in a candy to melt while you drink. If spicy is more your style, several Red Hots will add a kick to your drink. 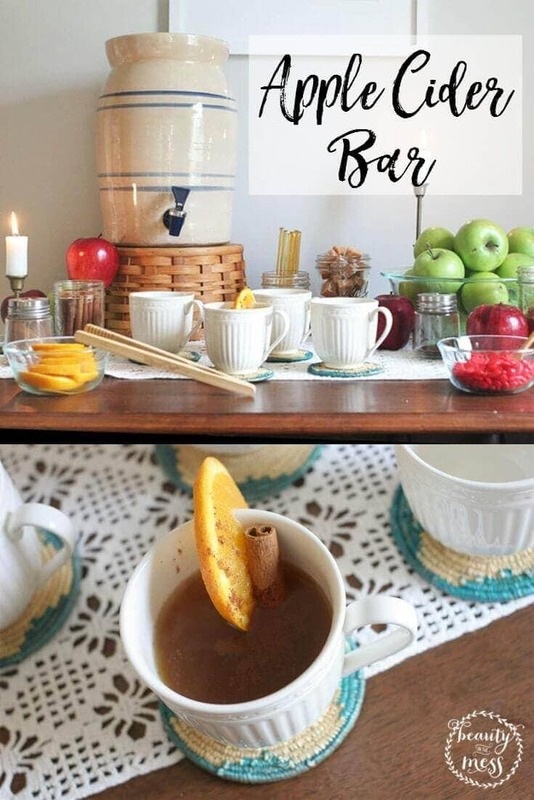 An Apple Cider Bar would be a special addition to Movie Night at home with the kids, or while celebrating Thanksgiving with family. It works for a big event or a small gathering. Your friends and family will have fun creating their unique cider, but you won’t have to spend hours prepping to pull it together. We enjoyed our Apple Cider on a Friday morning, right after my son learned all about apples at school. We chatted about the different colors of the fruit, its food group and why it’s a healthy choice. You don’t even need a special occasion to celebrate the seasons. 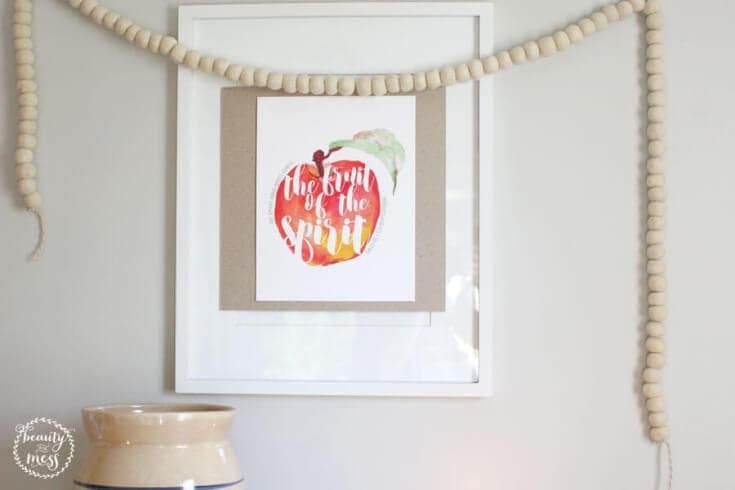 Since the Fruit Of The Spirit print was hanging above the Apple Cider Bar, our morning devotion was centered around Galatians 5:22-23. 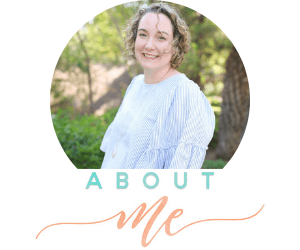 We chatted about how God uses fruit to describe the goodness that is evident in our lives when we know Jesus. Then we drank warm cider, made from apples, part of God’s Creation. 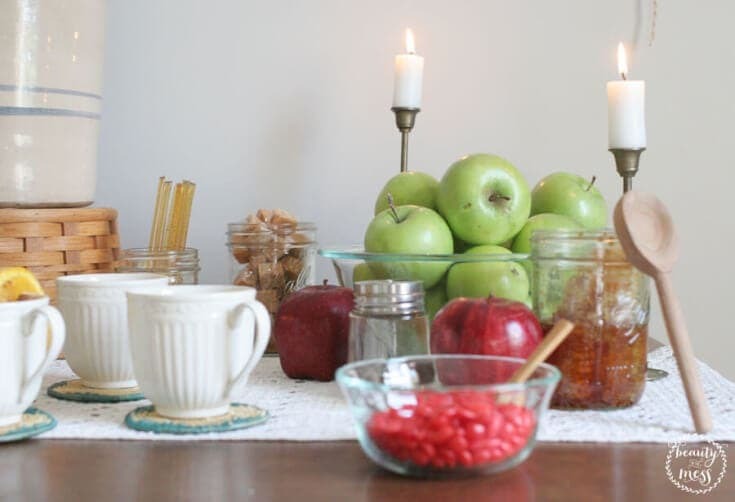 Throw a party, have friends over, or just celebrate fall with your family on a quiet morning. Keep celebrations simple so that you can enjoy more of them and create memorable moments in your home. How do you keep entertaining simple? Oh my goodness sounds so delicious! 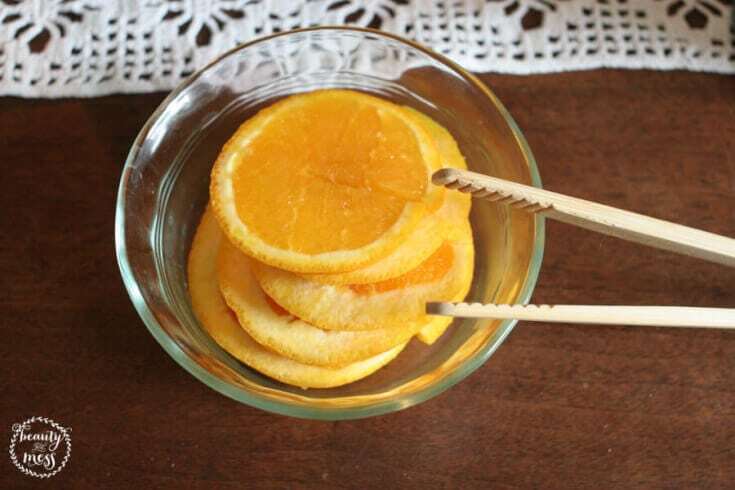 An orange slice and cinnamon stick for me 🙂 It’s such a warm and inviting set up, too. This looks delicious! I love everything apple cider and I love an apple cider bar. 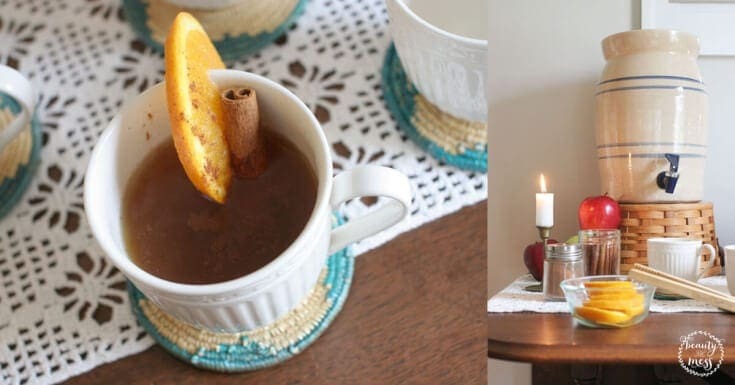 I too have made an apple cider bar and had friends over and it was such a great time drinking apple cider after dinner. I love how you tied in the drink with the message of God’s creation. Such a great way to help little minds grasp the concept of Biblical meaning. Thanks, Zan 🙂 It was perfect! We had just been on an apple orchard field trip, too! So, it really helped him grasp the fruit of the spirit. Oh my goodness, this sounds amazing! I love that you took something so simple and made it cozy and inviting. This would be a great little set up to have at a book club too! Thanks, Shani! A book club would be a great idea to use this! !